This is the fifth in a series of posts reporting on the Wildlife Conservation UAV Challenge fact-finding mission to South Africa. CHALLENGE UPDATE: Over 70 teams from 20 countries and 6 continents have signed up to compete. 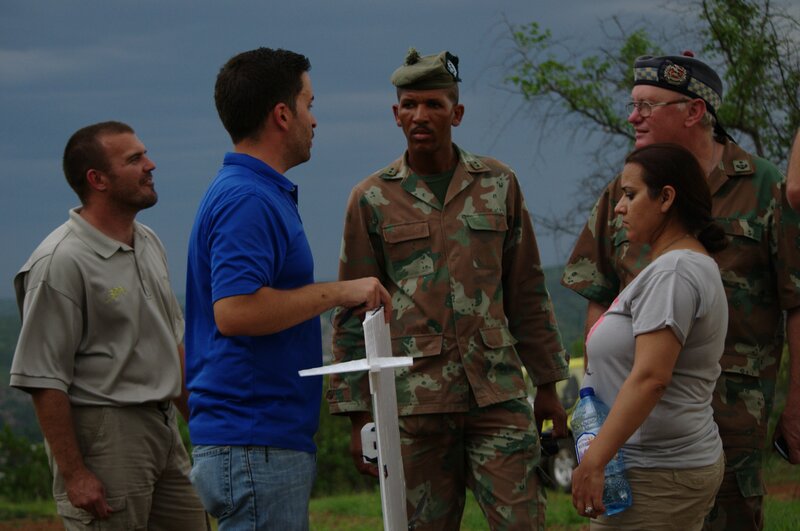 The Colonel briefs RPA Director General Scott “LB” Williams on border operations. 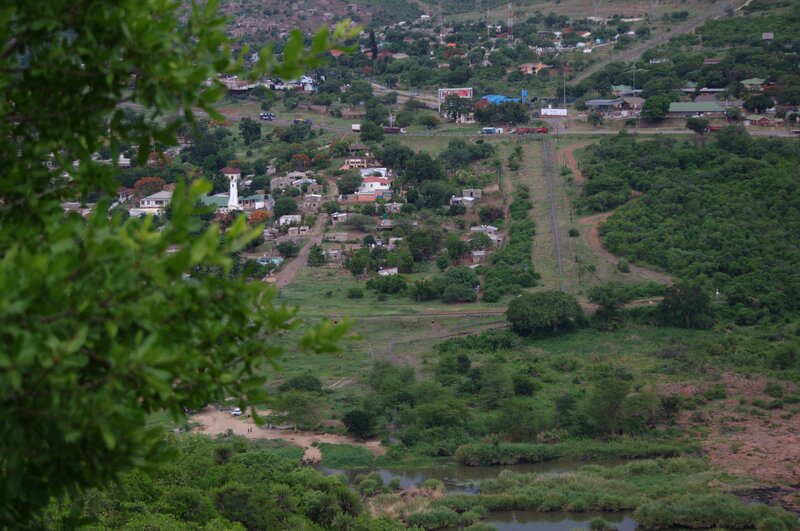 NEAR THE MOZAMBIQUE BORDER — The forward camp of the South African National Defense Forces (SANDF) squats on a bluff overlooking the border. Separating South Africa from Mozambique here is a valley. On the other side is a fence and a border town that looks out of place. The team surveys the landscape in preparation for flying. There’s no sense of urgency here. Not that it would do any good. This is a war zone to be sure. But it’s a waiting game. The enemy is not invading in tanks or firing mortars. They aren’t attacking well known towns or villages. This is not a war for land. That would be easy enough to defend against. This invader is insidious. It slips in, locates and slaughters a national treasure. In a land of high poverty and little opportunity, a crime against all humanity isn’t given a second thought. Aurora Flight Science’s small UAV “skate” is prepared for flight. 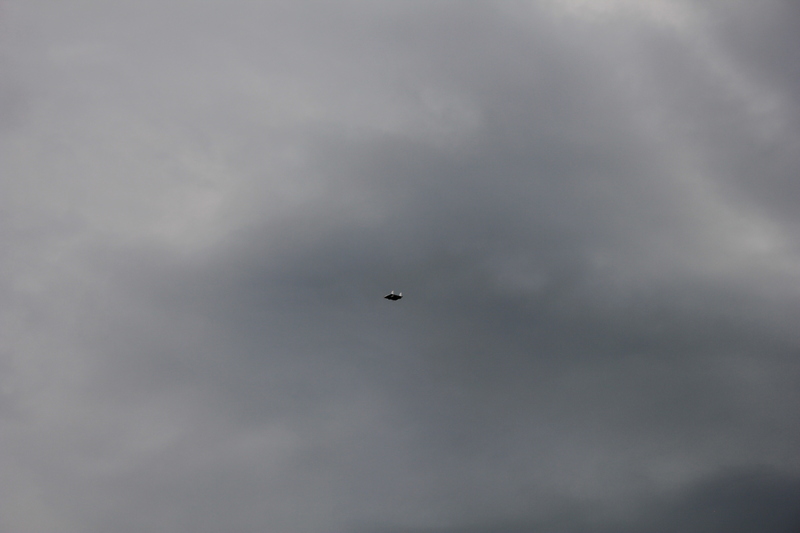 With little fanfare, a small UAV with a camera was launched. 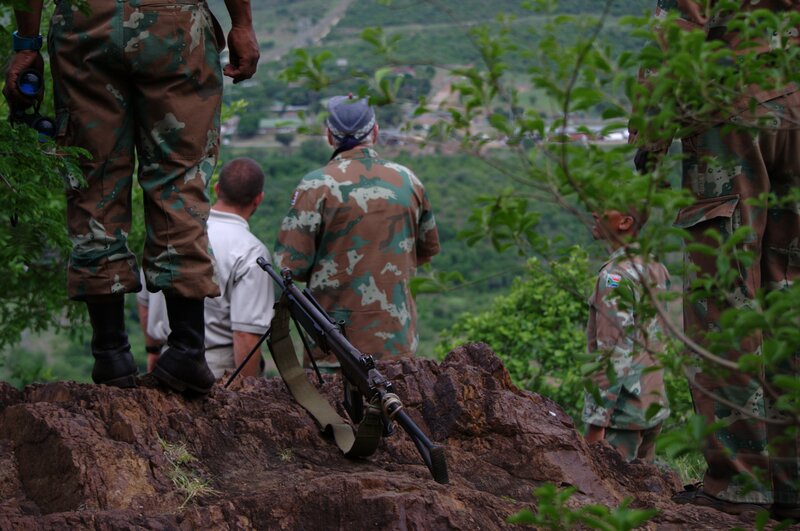 For the first time it showed SANDF troops live video of the base of the cliff they were standing on. They saw aerial views of illegal border crossings. They peered into border camps from South African airspace that yielded clues about the planning and movement of potential poachers. “Skate” provides live aerial surveillance of the Mozambique border. 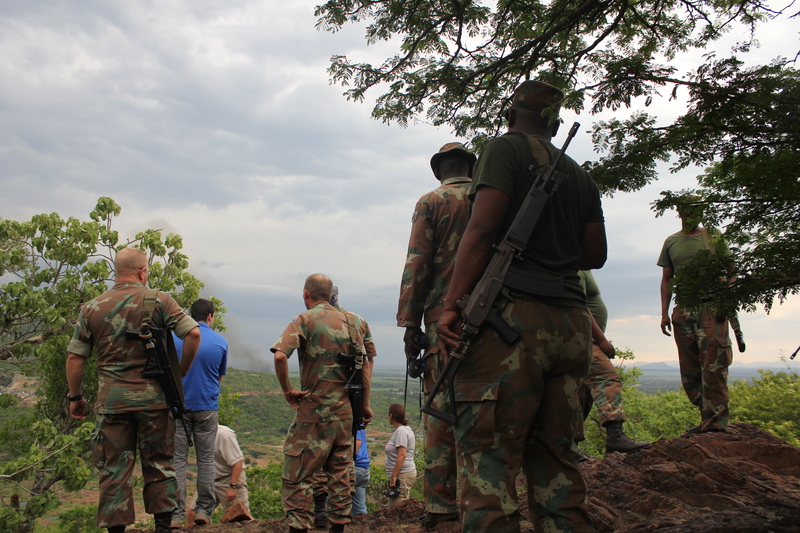 SANDF troops huddle around John Glezellis from Aurora to view aerial surveillance of the Mozambique border. Greater than any direct impact, our presence and the demonstration of the technology was for the troops a manifestation of a global, international response. In a fight where every rhino lost could be internalized as a failure, the show of support was good for morale. 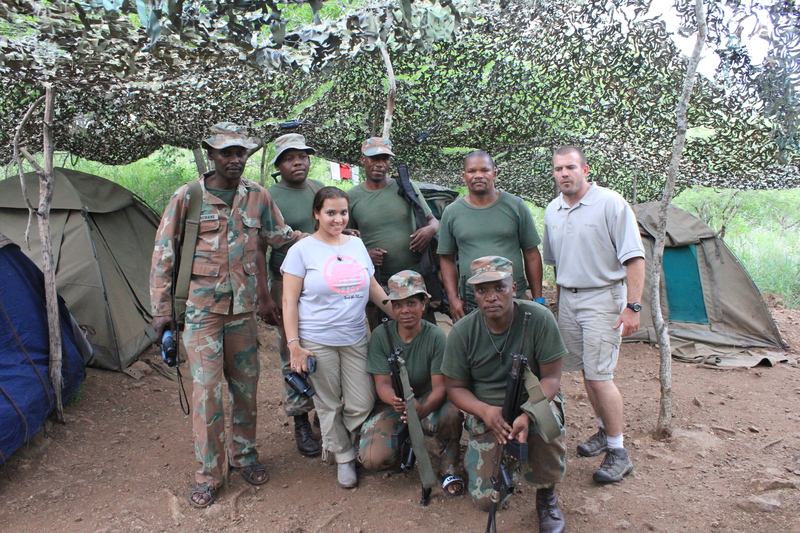 Al-Kareem founder and challenge creator Princess Aliyah meets with SANDF troops. Princess Aliyah’s message to the frontline troops was that the world was behind them. “The world will know who you are and the important work you are doing to stop poaching. We must protect the animals and the people from around the world are answering the call to help any way they can,” she said. 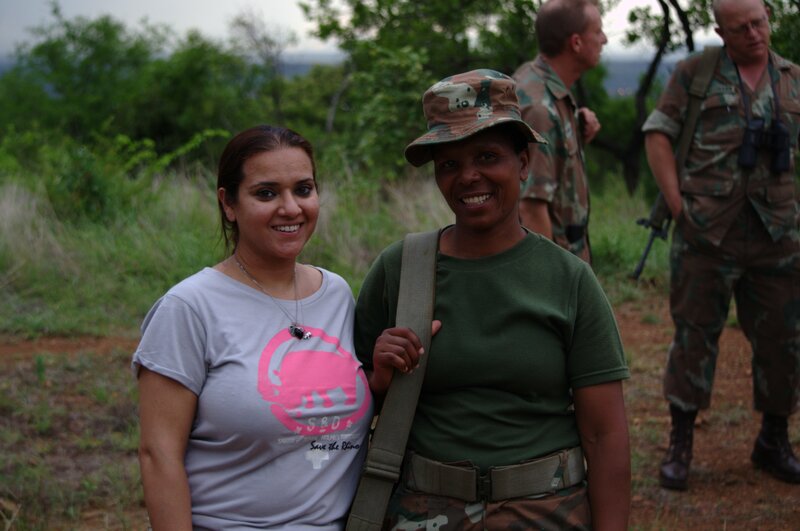 South Africa’s policy towards women in combat roles is progressive. Princess Aliyah singled out one of the female combat troops on the front lines. Princess Aliyah meets with a female soldier. 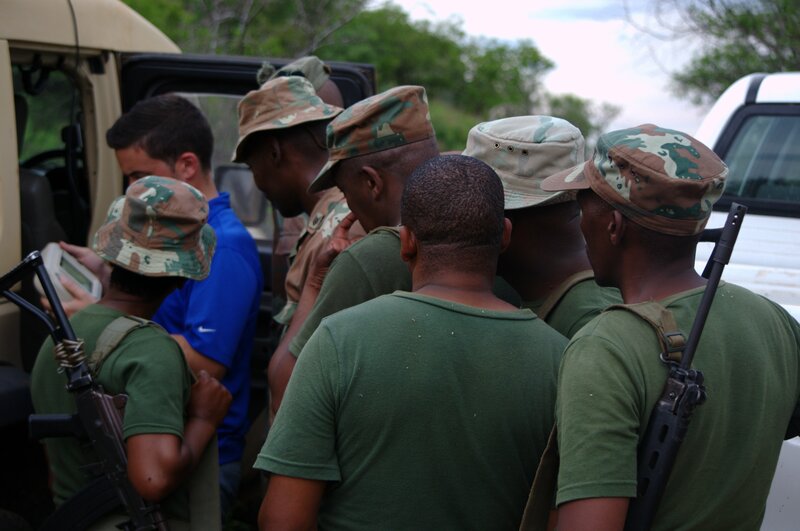 In August, representatives from SANParks visited the US and the UK to appeal to the international community for help. They had a tragedy unfolding and the whole world was watching it happen. Being here now 3 months later is the early response to that call. More help is on the way, but people with the means to help need to know: Eight rhino have been killed in the four days we’ve been in Kruger Park.